There’s a knack to using a corkscrew, but if you just can’t seem to master it, it’s probably because of the corkscrew you’re using rather than your technique. Here we’ll talk you through the different types available to help you decide what’s best for you. The fact of the matter is, there is no 'best' wine opener. When it comes to opening your bottle of wine, you’ll want to have something to hand that you feel comfortable with. A classic corkscrew such as the Le Creuset Waiter's Friend Bottle Opener is often a popular choice, but if you struggle with the technique, then winged corkscrews give you that extra bit of leverage. Check out the features of the ones we’ve picked to find out what will work well for you. By the way, a wine opener is an excellent Christmas gift; when you've finished browsing, be inspired by more Christmas gift ideas in our Christmas pages. Anything Le Creuset tends to suggest luxury and professionalism, and that’s exactly what this corkscrew offers. 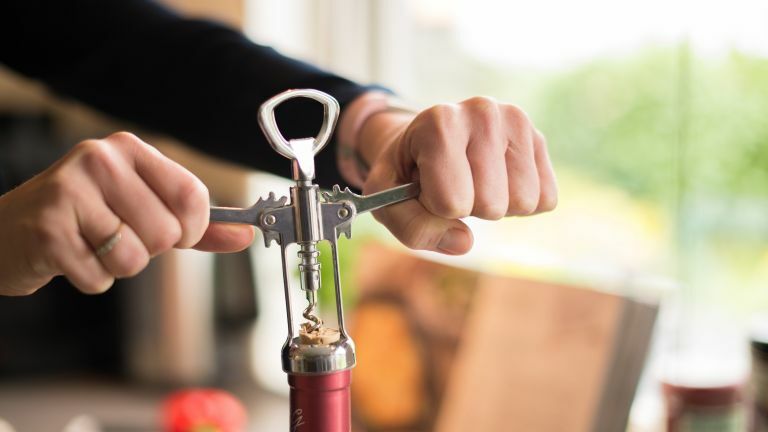 This simple lever mechanism will remove the wine cork in just a few movements, without the risk of slipping like a traditional corkscrew sometimes does. You can expect to open your favourite wines smoothly and without corkage whether it be at a dinner party or just a cheeky midweek glass on the couch. This one touch operation wine opener takes any guesswork out of the process so you can quickly and easily remove a natural or synthetic cork without it breaking. It is rechargeable, and for anyone who has arthritis or weaker wrists, this is the perfect way to ensure you don’t miss out on your favourite tipple. If a classic design has always worked for you in the past, then why change now? This classic waiter’s corkscrew by Le Creuset features an elegant wooden and stainless steel design that has a foil cutter and a built in bottle opener for when you fancy a beer instead. Handy for keeping in your pocket if you’re a waiter (or are treated like one at home), and it’s scratch resistant so it will always remain professional looking. This corkscrew eliminates any risk of the cork snapping half way through trying to remove it, as it doesn’t require any pulling action. All it takes is a few simple twists to remove the cork in one continuous turn. This style is designed for comfortable grip, with no need to fiddle about with different levers. If the traditional style corkscrew just doesn’t work for you, a winged corkscrew like this one should give you the extra leverage you need to remove a stubborn cork with ease. Simply twist in and push down on the wings to release the cork. It also comes with two attractive bottle stoppers. This elegant looking 'Rabbit' lever wine opener could be just the thing for any wine lover’s kitchen drawer. It is an easy to use corkscrew with a shiny chrome finish that comes presented in a beautiful gift box. It can remove standard or synthetic corks and even Champagne corks. A stylish and practical addition to your drinks' cabinet. This shiny and cute corkscrew may seem like a bit of a novelty, but in actual fact it is said to be incredibly durable and super-efficient when it comes to popping a bottle of your favourite Merlot. It’s a little pricey but customers say it makes a great practical gift for weddings or housewarmings, and you can expect it to last without rust, too. The cork's popped – now what? Our list of the best wine glasses for fulsome reds, effervescent sparklers and more should be able to help.